Swing, a pull out cleaning tray and safety grill and a convenient carry handle. 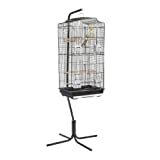 This elegant large bird cage is perfect for any small bird or multiple group of birds This cage is ideal for Budgies, Cockatiels, Lovebirds, Parakeets, Small Conures, Finches and Canaries. The cage features 3 wooden perches, 4 feeder dishes, 2 large front opening doors, a swing, a pull out cleaning tray and safety grill and a convenient carry handle.